Following Nestlé’s entry into the UK and Irish formula markets in December 2012, when it finalised its takeover of Pfizer Nutrition/Wyeth and the SMA brand, we are starting to see more aggressive baby milk marketing practices, both from Nestlé and its main competitor, Danone. Danone is second to Nestlé in the global market and both are major sources of violations of the marketing requirements adopted by the World Health Assembly (WHA), particularly in Asia. Marketing standards were never very high in the UK, but they are on the slide as this competition reaches our shores. Successive governments have failed to implement the International Code of Marketing of Breastmilk Substitutes and subsequent, relevant WHA Resolutions in legislation. Therefore, it falls to everyone who cares about infant health and the right of parents, carers and health workers to receive accurate, independent information to join us in saying these minimum requirements should be respected. 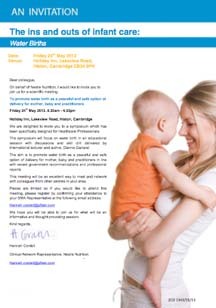 We have been receiving reports of Nestlé’s Clinical Network Representative approaching health workers inviting them to attend events on “The ins and outs of child care” – offering information on topics such as water birth (left), a free lunch and, ah yes, “New Product developments in SMA”, the infant formula brand Nestlé now markets in the UK. Similar strategies have been described by the former Nestlé medical representative from Pakistan, Syed Aamir Raza, who blew the whistle on how Nestlé operates, documented in detail how he was trained to rate health workers in accordance with the number of patients they are responsible for and their decision-making power. He had a budget to wine and dine, buy gifts, pay for travel and to fund seminars. It should not come as a surprise that there is an ulterior motive to company largesse. Companies have a legal obligation to maximise shareholder value: any expenditure has to benefit the company. When Nestlé sponsors the London Marathon, it is obvious it is to promote its Pure Life bottled water brand and to give participants little choice but to drink it. It is just as obvious that when Nestlé, Danone or any other company funds events for health workers – or offers to sponsor them – it is also an investment that has to make a profit for the company concerned. Put yourselves in the shoes of a company executive. Why are you using money from your budget for this purpose – why do you even have this budget? Where does the money come from? In the case of baby food companies targeting midwives, health visitors and others involved in mother and child health, the money comes from a premium on the price of formula and the expectation is the expenditure will result in greater sales. Nestlé’s underlying purpose of targeting doulas with events on water birth is to promote its SMA brand. Even when companies do not promote specific products directly at their events and through sponsorship, they are seeking to promote their company names, build relationships with health workers, gain kudos by association and draw those who take company money into defending the relationship and the company’s practices. Baby food companies obviously have a conflict of interest in funding such events. The International Baby Food Action Network (IBFAN, of which Baby Milk Action is the UK member) sets this out clearly in its briefing paper on sponsorship. India has implemented the WHA Resolutions in legislation, outlawing such sponsorship. The Indian Government has confirmed that Nestlé’s events targeting health workers in India break its laws. I raised the Government’s concerns and the WHA Resolutions at the Nestlé shareholder meeting in 2012 and the response from Chairman, Peter Brabeck-Letmathé, was it is not for Baby Milk Acton to tell him what to do – then he showed a film he had prepared earlier about training for health workers. He had intended to divert attention from more obvious baby milk marketing strategies, which I had also raised, a trick in keeping with the Public Relations strategy developed by Raphael Pagan for the company in the 1970s: suggest that only ‘activists’ criticise the company and divert criticism. See our new report Nestlé’s Creative Storytelling Venture for more on Nestlé’s PR strategy. 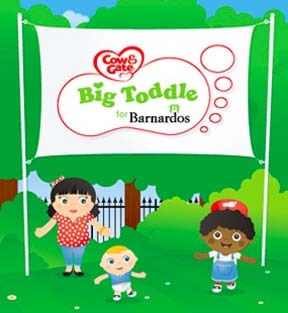 Danone has stepped up its own brand promotion in the UK and Ireland following Nestlé’s entry into the market, for example by promoting its Cow & Gate formula logo through its association with Barnardos Ireland’s Big Toddle, launched last month (April 2013). * The sponsored organisation can be drawn into defending the company if the relationship is criticised. On the latter point, members of the public report receiving emails from Barnardos Ireland relaying Danone’s claim to abide by the International Code. This defence of Danone ignores the evidence of systematic violations from IBFAN, Save the Children, UNICEF Lao etc. Many organisations do look to corporate sponsors and where to draw the line is something that requires careful and open debate. We encourage members of the Baby Feeding Law Group (BFLG) – who are joining us in calling for the Code and Resolutions to be implemented in the UK – to develop and publish sponsorship policies and bring these into line with the Code and Resolutions. Some members have moved in this direction. Some have dropped advertising from formula manufacturers from their publications, for example. Some still have to take this step and some are even drawn into sponsorship deals: I have recently seen on Twitter that one member, the Royal College of Midwives, has a legal conference on 11 July 2013 sponsored by Danone. Danone has long targetted midwives. This includes encouraging midwives to work for it off the books: Danone offers to pay midwives to work for its formula-branded telephone carelines through an agency so they can claim to be doing bank work without mentioning they are working for a baby milk company. While the strategy is not new, Danone is increasingly more explicit in linking its sponsorship and events to formula brand promotion. For example, it is sponsoring Feeding for Life magazine, distributed to health visitors. This incorporates the Cow & Gate formula logo in its title (shown on the cover of our Look What They’re Doing in the UK 2013 monitoring report, left). The Feeding for Life website links directly to Danone’s In Practice website, which is Cow & Gate branded and promotes formula on the landing page with idealising claims that do not stand up to scrutiny. Danone has also been organising events for health workers under the title of The Learning Curve. There was an event on 8 May aimed at midwives and healthcare professional. It looks like this will be one of the last with this branding as in the new competitive environment following Nestlé entry into the market, it is being rebranded to directly promote Aptamil and Cow & Gate formulas. A buffet was provided at Danone’s event, but this is no free lunch: it is paid for by a premium on the price of formula. 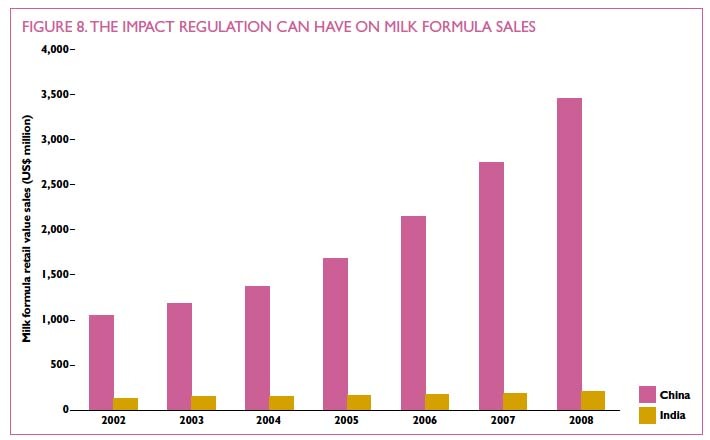 This is why Baby Milk Action has a “no promotion – cheaper formula” campaign. Companies are not attempting to fill a vacuum in taking on a role of health and nutrition education: they are supplanting independent sources. A clear indication of this is how both Nestlé and Danone are co-opting the slogan of the first 1000 days, which is used by various health and development bodies in providing information to parents from conception through the early years. Nestlé has launched its own first 1000 days advertising campaign in India to associate itself with this message. Danone registered the domain name http://www.first1000days.ie/ under its Nutricia subsidiary a few months after NCT’s trademark registration. At the moment there is a holding page on the domain. Danone is increasingly aggressive on the internet. So much so it is a finalist in industry awards for its innovative use of Facebook and apps to promote its Cow & Gate and Aptamil formula brands at the Irish Social Media Awards on 30 May 2013. Danone is also trailing materials in crèches and seeking mothers and babies as photographic models at the present time. 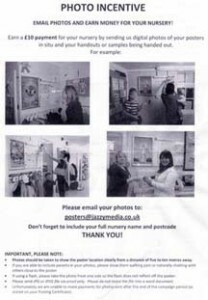 To gain photographs of the materials being used, it is running a competition offering crèches money for photographs showing magazines being handed out, posters for Cow & Gate Growing up milk on display or samples being handed to parents. Again, the company’s aim is product and brand promotion, association with the recipient organisation and drawing the organisation into defending the company if challenged on why it is helping a company violate baby milk marketing requirements. Seeking direct and indirect contact with parents in this way is explicitly prohibited by Article 5.5 of the International Code. We are engaged in ongoing, written communication with Danone executives about its systematic violations of the Code and Resolutions. While this has prompted some changes, executives defend their wilful violation of Article 5.5 claiming parents need information. But there is no excuse for violating the marketing requirements – and given the Advertising Standards Authority has ruled against claims made in the advertising for Danone’s formula brands, it clearly is not a reliable and objective source of information. When I raised concerns about violations and, in particular, illegal sponsorship of health workers in India with Nestlé’s Chairman, he told me it is not for Baby Milk Action to tell him what to do. Will health workers tell him and other company executives what to do when they come waving a wadge of money creamed off the income from baby milk sales? India’s law came about because health workers first took action: the Indian Paediatric Association said in the 1990s that it would accept no baby food company funding for its events, even if – horror of horrors – they had to pay for their own lunch and stay in a less luxurious hotel. What mattered to them was information and that it be independent. The prohibition on baby food company sponsorship was later enshrined in law. India has strong implementation in other ways, leading to Nestlé products being seized for having idealising information on labels in 2012. The difference with a country such as China, with little in the way of regulation, can be seen from this graph in the recent Save the Children report on the need to protect, promote and support breastfeeding: sales grow exponentially in China, whereas they remain virtually static in India. Unfortunately the poor state of regulation in the UK – and the failure of companies and some health workers to meet their own obligations under the Code and Resolutions – means we are more like China than India. The gradual improvement in breastfeeding rates – glacial in terms of exclusive breastfeeding to 6 months – may well be reversed now that Nestlé and Danone have the gloves off here too. Of course, if Nestlé and Danone are serious about wanting to have a positive impact on public health then there is something they can do that won’t require lavishing money on health workers: they can market their breastmilk substitutes in accordance with the minimum standards. Breastmilk substitutes are a necessary product in certain circumstances, although follow-on formulas have been described by the World Health Assembly as not necessary and so-called growing up milks have been invented to part parents from their cash – pure and simple. 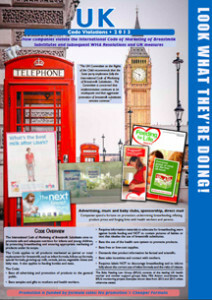 See the excellent Guide to Infant Milks in the UK for further information. The companies will have far more positive impact on breastfeeding rates and infant health if they ended the systematic violations, played by the rules and stopped spending a fortune on promotion. That would also allow them to sell formula more cheaply for those parents and carers who do use it. The next time you see a baby food company offering money or it being named as a sponsor on an event you were thinking of attending you can cite the Code and Resolutions as a reason for refusing to be involved. Be inspired by Philomena Canning who turned down the award of Midwife of the Year in Ireland, which she won in a parenting magazine vote in 2012, after finding it would have branded her the SMA Midwife of the Year. When policy makers fail us, babies and parents, we have to set our own standards. Also sign and promote our No promotion – Cheaper formula petition.